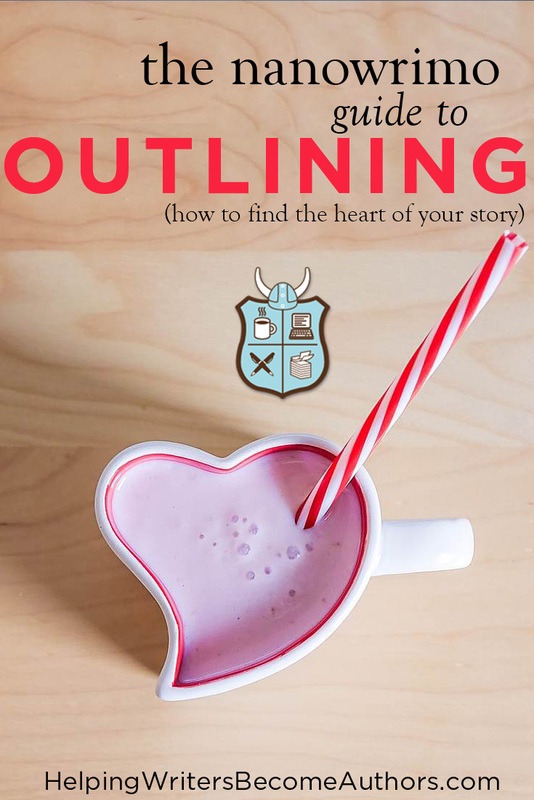 Most of the time when you start figuring out how to outline a story, you know one of two things about that story. Either you know the skeleton of your story (its premise or plot), or you know the heart of your story. But it’s not enough to have just one. You gotta have both. On its surface, it certainly seems as if story is plot—the mechanics of characters doing things in pursuit of their goals. But as important and fun as all that stuff is, it’s just window dressing. To find the story you’re really telling—the story that’s really worth telling—you must look deeper. You must find the beating, pulsing heart of your story. Otherwise, no matter how flash your plot may be, what you’re really creating is nothing more than a robot. It may move around prettily, but look into its eyes and you’ll know it’s empty inside—soulless, lifeless, heartless. Today, we’re going to fix that. So here you are, halfway through October, still figuring out how to outline for NaNoWriMo (or any other month of the year). You’ve already figured out the bones of your story—the answers to the four basic questions that power your plot (which we discussed in last week’s post). But something’s missing. You have some cool ideas. But they just don’t seem like they’ve come alive for you yet. Or maybe you were able to hear your story’s beating heart right from the beginning, but now its rhythm seems a little fainter, lost amid all the external plot stuff you dreamed up in the beginning of your outline. Either way, now that you have a body for your story’s heart to live in, you’re ready to find that heart, refine it, and use it to make sure you create a plot with power and meaning. Boiled down to its lowest common denominator, the heart of your story is its theme. This is what your story is about on a deeper, spiritual level. It is what your story is truly about, the black-and-white, archetypal, primal search for meaning and truth in the human life. This is what every story—even the most careless—is about on some level. And the best stories are always those that tackle their themes head on and harmonize them with hard-hitting and pertinent plots that externalize their moral premises. I’m glad you asked. Because the answer is: Oh boy yeah. In fact, theme is one of the single most important story elements you can address in the outline. An early understanding of your story’s thematic questions will provide you the foundation you need to make all the varied story decisions that follow. Without this foundation, you won’t be able to pull the disparate elements of your story—plot, character, and theme—together into a seamless whole with a cohesive focus. This is why the thematic questions are always my very next stop in my outline after figuring out the basics of the plot. Before I go one step further with my characters’ external adventure, I must first understand their internal journeys. Only then, can I move forward in crafting an external plot that catalyzes the inner journey and (even cooler!) provides an external metaphor for the very heart of the story. 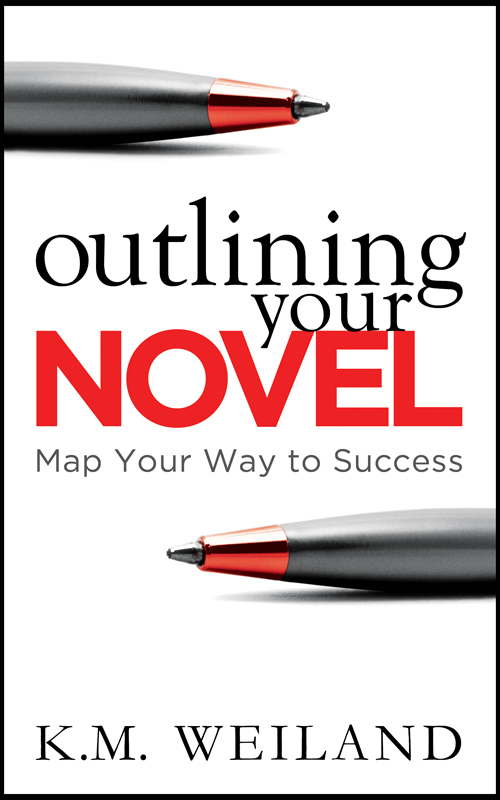 Outlining is very much about a melding of the minds: your “circular”/subconscious/”right-brain” creativity and your linear/conscious/”left-brain” logic. You’ll be bouncing back and forth between “loose” creativity and “tight” logic throughout the outlining process. 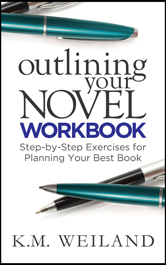 But it’s worth repeating that the General Sketches section of the outline (which I talk about in my books Outlining Your Novel and the Outlining Your Novel Workbook) is where you want to keep your brain at its loosest. You don’t want to impose too much linearity on the process just yet. You’re still just throwing paints at the wall to see which colors stick. I write my General Sketches longhand in a notebook. I keep it very stream of conscious, more like a conversation with myself than anything. I’m asking questions, following the answers to their logical conclusions, discarding what doesn’t work, and answering whatever new questions then arise. I like the idea that Chris thinks everything is in place for him now—there’s a little Pride and Complacency at work—and he has to relearn his lesson. Chris is more peace than Allara is. But he also starts out with a simple worldview. The worlds got knocked into focus for him after the last Book, and now they’re opened back up, it seems like God’s will, like God is rewarding his sacrifice. It all makes sense—until it doesn’t. At that point, wouldn’t he be in despair? He did this once—gave everything, down to his very life. Now what? 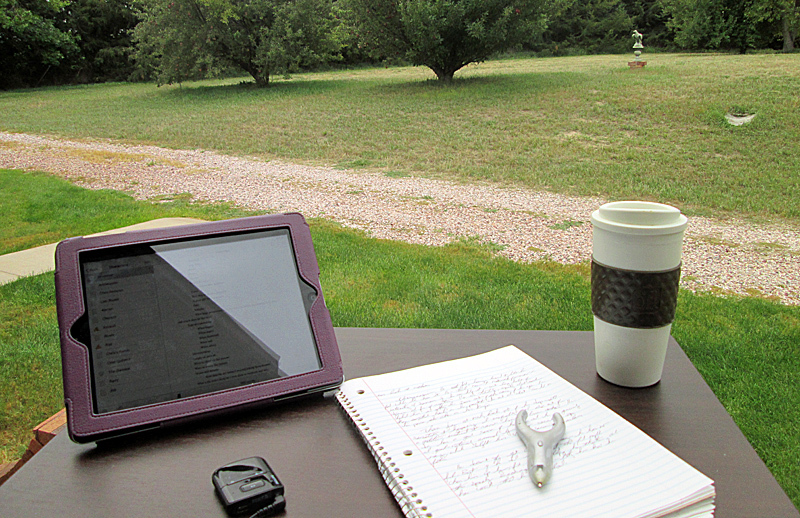 I write my outlines longhand in a notebook (with an ergonomic pen). Get out your notebook or other outlining tool of choice and start by asking yourself the following questions on paper. Explore all the obvious answers until you find the ones that fit, that feel right, and that make sense within your vision for the plot. Find those answers, and you will find the heart of your story. 1. Plot: What Is Your Story’s External Conflict? It’s true, we’re here today trying to find the heart of your story. But to do that, you must first remember all of fiction is a balancing act. The process of outlining a story is a continual bob and weave of sewing in first one story element and then another. We’re going to discuss this is much more depth in a future installment in this series. For now, suffice it that to find the heart of your story, you must actually begin with the skeleton. You should already have identified your story’s basic plot, via last week’s 4 outlining questions. Now, it’s time to stop and take a long hard look at the plot you uncovered. What is it really about? What is the story under its skeleton? What is your protagonist trying to achieve? Why is he trying to achieve it? What is the antagonist trying to achieve? What are the stakes (personal and public) should the protagonist fail? How will the protagonist have to change to be able to externally and physically defeat the antagonistic force and gain his goal? Your plot provides the framework for the theme that will emerge. Indeed, the plot must provide the framework, or else the heart of your story will fail to be central to the external story. 2. Character: What Is Your Story’s Internal Conflict? In laying the framework for your story’s external conflict, you have also laid the framework for its internal conflict. Your protagonist’s internal conflict is the foundation for his character arc. Character arc is the transition a character undergoes over the course of the story. This change—whether for good or bad—is the heart of your story. Why? Because in change there is always purpose, there is always reason. Without change to either the character or the world around him, the story remains static—and has no point. In a Positive Change Arc, the character will transform into a better or more equipped person. He learns the necessary survival skills—on an inner level—that allow him to appropriately handle his external conflict. In a Negative Change Arc, he will learn incorrect skills or beliefs, which will ultimately cripple him in his pursuit of both his outer goals and his inner wholeness. 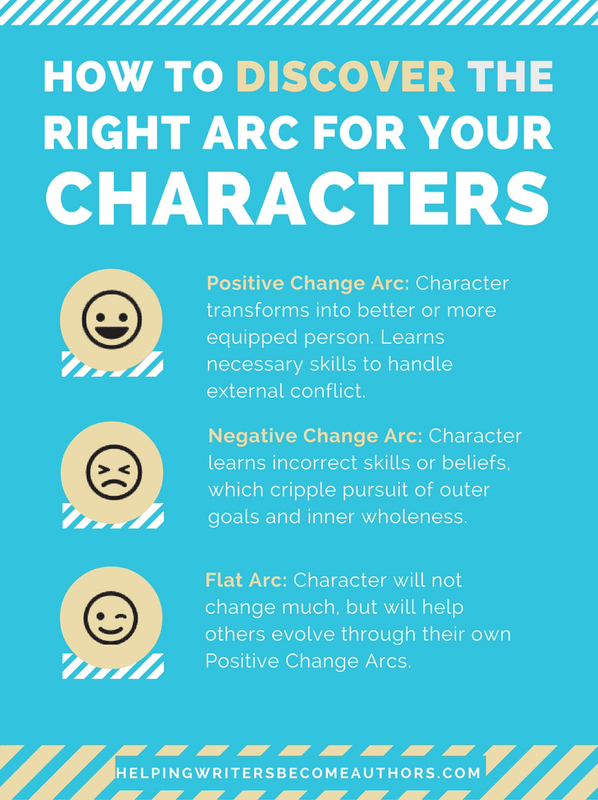 In a Flat Arc, the character himself will not change much, but he will help others around him to evolve through their own Positive Change Arcs. Find the heart of your story in your theme by first determining which of the three character arcs your protagonist following. 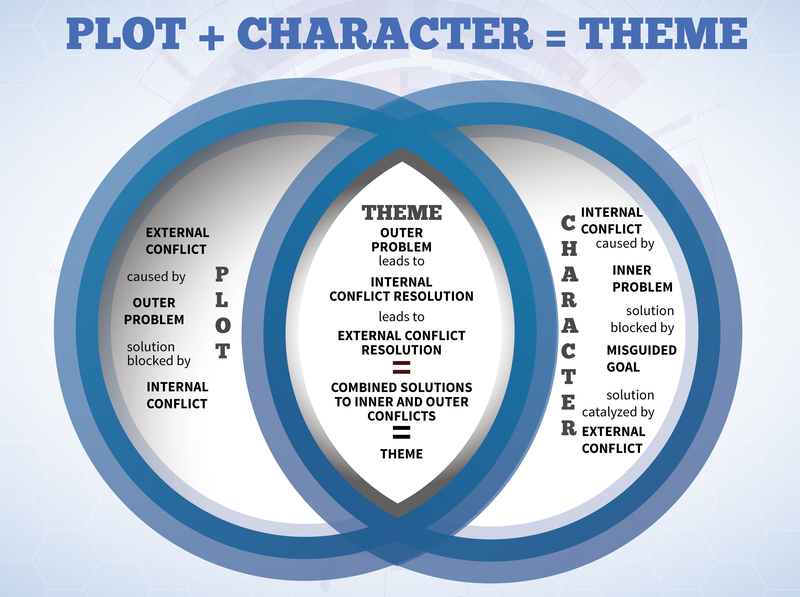 To determine which type of arc is best for your story, consider the external conflict. Will your character achieve his end goal? Why or why not? Will he end as a better or worse person? How might he need to grow into a better person in order to gain his goal? How might his personal desires and motives change over the course of the story? Prompts the external plot goal. Is a conscious desire on the part of the protagonist. Is a wrongful desire (either because it is an inherently harmful or selfish end goal or because the character blindly believes it will fix his inner problems when it will not). Is based on a Lie (see next section). Is an internal thematic need. Is often an unconscious desire on the part of the protagonist. Is a healthy desire (which will ultimately lead to health, fulfillment, and wholeness—but not necessarily external gratification). Is based on a Truth (see next section). 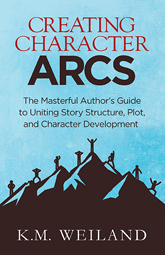 Your external plot will usually show you what type of arc your character will be following. But only by recognizing, claiming, and strengthening that arc, via these internal-conflict questions, can you then knead the internal plot back into the external in a cohesive and seamless way. 3. Theme: What Is Your Story’s Theme? And that brings us to the theme. Some authors shy away from consciously claiming their themes, believing the theme will become too on the nose. But here’s the truth: your theme doesn’t just arise somewhere late in the story. It’s there, right from the start, in the conflict between your character’s external and internal needs. In order to fully understand the import and potential of your plot and character arc, you must also bring the third member of the story trifecta front and center. If you’ve answered the questions in the previous two sections, then your theme is already right there in front of you. But let’s clear the fog a little more. Let’s boil down your character’s conflicting Want and Need into something more fundamental and primal: a universal thematic premise. Stop thinking of theme as a nebulous transcendent concept. 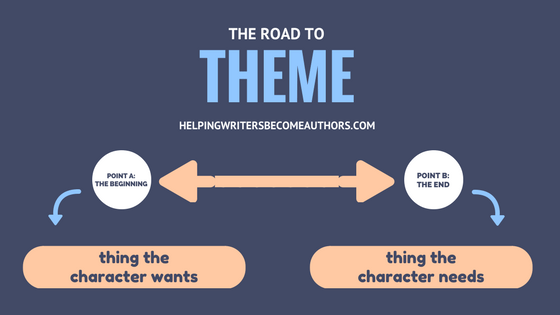 Instead, think of your theme as a road within a defined beginning and ending. As you figure out how to find the heart of your story, what you’re ultimately looking for is the story-long journey of theme. Both your story and your theme begin with a false premise: your character believes a Lie. This Lie is what fuels the Thing He Wants. The Lie is what leads him to believe that if he can only gain the Thing He Wants, his inner self will find wholeness and victory. Basically, this Lie has your character convinced he can fix his broken heart if only he can find the magic golden Band-Aid to put on his elbow. He’s deluded. And it’s killing him. That’s why your character must grow into an awareness of the fundamental illusion of his Lie—so he can instead embrace the empowering (if often difficult) Truth that will set him free. The Truth is the Thing Your Character Needs. It may or may not preclude the Thing He Wants. It may or may not lead him to final victory in the external plot. But it will always lead him to internal, spiritual victory. The Truth is your story’s thematic premise. The Truth is the heart of your story. The Truth is the inner story that is being proven by the metaphor of the outer story. Once you know your story’s Truth, you will be able to start mapping a way to help your character either find it or reject it in your story’s end. It will influence every important plot decision you make from this point on. Your thematic premise is going to exist at the heart of your story whether you recognize it early on in the outline or not. Why not claim it right away? The heart of your story is arguably the single most exciting element you’ll uncover during your outline. Theme is the reason stories remain the most powerful communication medium in existence. Having the opportunity to pack all that firepower into your story’s outline is a thrilling, heady, and deeply personal experience. Enjoy! Stay Tuned: Next week, we’re going to talk about how to spot and fill all your plot holes before they even happen.